With fresh troops arriving from Australia, General Legge, Commanding Officer of the AIF 1st Division in Gallipoli, was dispatched to Egypt to train and organise a new division for the Dardanelles. Following the failed attempt of the August offensive a request came from Hamilton for Legge to send his most advanced Brigade, the 5th, but within days this request was increased to include the 6th and 7th Brigades. Therefore the 22nd Battalion as part of the 6th Brigade, 2nd Division set sail for Gallipoli. The 2nd Division landed at Anzac on the 5th September 1915 and the Brigades moved forward to the front lines to relieve the exhausted troops of the 1st Division, with the 6th Brigade positioned in the vicinity of Lone Pine and the 22nd Battalion facing Johnston’s Jolly. However, unlike the 1st Division that endured the landing and subsequent offensives through the summer, events were evolving that would place the Brigades of the 2nd Division in a more defensive role. Determined Turkish defence in inhospitable terrain, demand increasing for more troops to support the pending offensives on the Western Front, the German – Bulgaria alliance that would enable heavy German artillery and potentially men to easily reach Turkey, plus the impending winter conditions meant that priorities were changing which would ultimately lead to the evacuation of the peninsular. Although no offensive or major fighting was undertaken, the 22nd Battalion endured the full harsh conditions of life in a front line trench for three months to the point of evacuation. The reality of war hit the Brigade before they had even reached Anzac Cove with the torpedoing on the 2nd September of the ‘Southland’ carrying the divisional headquarters and the 21st Battalion of the 6th Brigade. Thirty-two Australians lost their lives, most being drowned. Among them was Colonel Richard Linton, commander of the 6th Brigade, whose lifeboat had been overturned. In the early hours of 5th September the 22nd Battalion came ashore – a Private in A Company became the Battalion’s first battle casualty having been hit by a stray bullet – where guides took them to Rest Gully. The following day the Battalion marched the two miles to the front. Along the way many dead were seen and the stench and flies were unbearable. The Battalion relieved portions of the 6th, 7th, and 8th AIF Battalions in the position opposite Johnston’s Jolly linking up with the Lone Pine defences and commenced a tour of front line duty which lasted until the evacuation. Excursions at this time into open ground were limited to the odd scouting or patrols, but dangers were ever present in terms of shelling, sniping, mining, plus the added threats of disease and illness brought about by the inhospitable conditions. Sniping was becoming more prevalent with the provision of telescope-rifles, magnifying sights, silencers for fitting to rifle-muzzles, and a locally-invented device (known as the “Wallaby sniping cage “) for clamping down rifles to fire on fixed targets. During these months, however, the serious offensive action of General Birdwood’s force was not on the surface, but underground. At all vital points the enemy’s defences were too strong by both nature and fortification, and they were constantly being strengthened. Birdwood therefore decided that the best chance of successful assault lay in undermining them. Accordingly there commenced in September a comprehensive scheme for tunnelling beneath the enemy at The Apex, The Nek, Pope’s, Quinn’s, Courtney’s, German Officers’, Jolly – where the 22nd were positioned -, Lone Pine, and Ryrie’s Post. A tragic event however happened on 29th October for the 22nd when a mine driven under the Turkish lines was blown. Lieutenant Bowra went below before the fumes had cleared and was asphyxiated. Lieutenant Thom went to his rescue and suffered a similar fate, along with Privates Good and Stelling. For their gallantry during the operation Lieutenant’s Stewart and Bazeley received Military Crosses and Distinguished Conduct Medals were awarded to Private Kruger and Lance Corporal Stone. As Gorman in his History of the Battalion recalls, the men became accustomed to the routine of trench life. For the first month, rations were adequate but with all supplies including water having to come from Egypt, deteriorating weather with the onset of Autumn and Winter meant that the state of the sea determined their quantity and frequently their quality, as the bread often suffered from immersion in salt water. Meeting the water carriers brought in Furphy water carts enabled soldiers to pick up rumours from the rest of the war, often erroneous, and led to the slang of being told a ‘furphy’. During the last month of the campaign water was very scarce, and its issue carefully regulated. The end of September and the beginning of October brought severe heat. Dysentery was prevalent, and general health suffered. Clothing was reduced to a minimum and many wore their equipment over bare skin. Flies were plentiful and it was difficult to pass food from hand to mouth without their contamination. However the trenches were always kept scrupulously clean. The Battalions comparatively low sick-rate is part due to the strict sanitation enforced. The weather became wetter through October, and by the end of November was bitterly cold, and men became weakened by the monotonous diet of bully-beef and biscuits. Water was so scarce that snow had to be melted in biscuit tins. The machine guns were taken out of the trenches and thawed at the cook’s fire. The men’s boots were now suffering from wear and weather, and frost-bitten feet caused some evacuations. On 17th December 1915 the Gallipoli evacuation commenced, with the weakest men being sent out first. The most elaborate precautions were taken to prevent the enemy from guessing what was happening. Every article of equipment that could creak or rattle was securely tied. Boots were swathed in strips of blankets and fresh earth was thrown along the hard trench floors to deaden the sound of retreating footsteps. At 11pm on the 19th December 1915 the final evacuation commenced and by 1am only a few picked men remained. The picked men continued sniping until the last. At 2.45am the last few men of the 22nd Battalion left the front line, first fixing rifles at the loopholes with timed fuses and an arrangement of weights so that shots would continue to be discharged from the deserted trenches. Private Horan was the last to leave his post and was awarded the Distinguished Conduct Medal. As the last party embarked on the waiting barges, the mine at Russell’s Top was blown. According to Gorman in the Battalion History ‘With the Twenty-Second’, during its service in and prior to Gallipoli the 22nd Battalion suffered 616 casualties, of whom sixty were killed, 285 wounded, and 271 evacuated sick. Nine men died before the Battalion had left Egypt – seven from illness and two by accident. 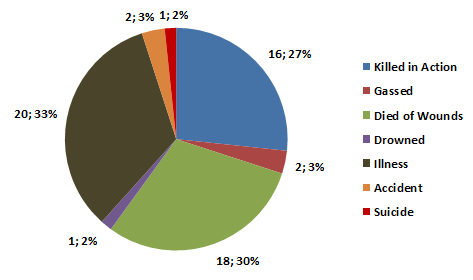 Given the disease rich conditions that the men had to endure at Gallipoli with rotting corpses in no-man’s land, poor sanitary conditions, poor diet and lack of water it is not surprising as shown in the adjacent pie chart that more men died of illness in the Battalion than were actually killed in action on the Peninsula. A further investigation into the impact of non-combat casualties on the fighting strength of the AIF in Gallipoli can be read in the accompanying case study on Sickness & Disease. The percentage of deaths from died of wounds is also high, but again should not be a surprise given the shortage of medical facilities close to the field, with casualties having to be evacuated to the hospital ships, and then to Alexandria, Lemnos or Malta. Many of the men that died from their wounds are commemorated on the Lone Pine Memorial as they were buried at sea. During the Gallipoli campaign thirteen men from the 22nd Battalion were awarded for their bravery, six of them during the evacuation of the 19th/20th December 1915. Click on the link or the Distinguished Conduct Medal image to learn more about these man and to read the citations describing their individual acts of gallantry.